Purchased homecoming garters can be quite pricey, so making one can offset the cost immensely. The rest of the country probably has little to no knowledge of this high school tradition, but if you're from the South, particularly in Texas, there is no explanation needed. Homecoming garters (or homecoming mums) resemble huge corsages surrounded by lots of ribbons, bells and trinkets that tell a story of a teenager's activities. Traditionally, a boy would make a hanging mum for his girlfriend and a girl would make a garter for her boyfriend. Over the years, this tradition has evolved, and all students seem to wear them now, even if they are not part of a couple. The instructions for this mum garter are meant as a guide to point you in the right direction for making your unique mum. Just as no teen is alike, neither are any two mums. Step 1: Make the backers. 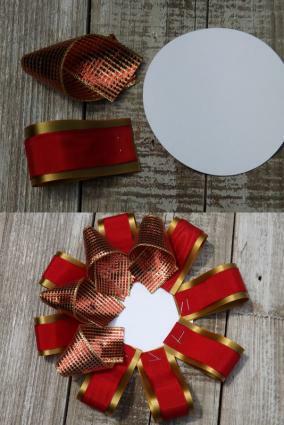 Cut four, 4-inch diameter circles from cardstock or lightweight cardboard. Recycled gift or cereal boxes are a good alternative. Step 2: Make the loops. Cut eight, 6-inch lengths from both the 1-1/2-inch-wide and 1-inch-wide ribbon in your school's colors. Center one thin ribbon on top of one wide ribbon. Fold the ribbon in half with the short ends together. Do not crease the fold. Staple the short ends together. Repeat with the remaining ribbon to create eight loops. Step 3: Make the points. Cut eight, 6-inch lengths from 1-1/2-inch-wide ribbon in your school's colors. Hold the length of one ribbon horizontal with the back facing you. Bring the short ends together, rotating and crossing the ends with the right sides facing you to form a point. Staple the crossed ends together. Repeat with the remaining ribbon to create eight points. Evenly space the loops around the edge of one backer circle and staple to secure. Overlap and position the points between the loops. Staple to secure. This is your top backer. Step 5: Prepare your flower. Remove the stem from a four-inch ball mum. This can usually be accomplished by simply pulling the stem out of the bottom of the flower. Thread a bead onto the end of a chenille pipe cleaner. Bend one-inch of the pipe cleaner over the bead and twist it around the longer length. Insert the pipe cleaner through the center hole of the flower, from the front to the back. Pull until the bead is securely embedded inside the petals of the flower. The bead will keep the pipe cleaner from coming loose and prevent the petals of the flower from coming apart. Step 6: Attach the flower. Pierce a small hole through the center of the top backer using the tip of scissors, a pencil or a wooden skewer. Apply hot glue to the front of the backer. Insert the stem of the pipe cleaner through the hole on the front of the backer and pull until the mum is sitting in the glue. Allow the glue to cool. Step 7: Attach your base ribbon streamers. Cut 18- to 24-inch lengths from assorted ribbon in your school's colors. Approximately 15 ribbons will make a nice, full base, but you can attach as many as you like. Arrange as desired and staple one end of each along a five-inch length on the edge of a second backer. Step 8: Make a homecoming loop streamer. Make 11 loops in the same way as in step 2. Cut an 18-inch length from 2-inch-wide metallic honeycomb ribbon that coordinates with your school's colors. Starting at the bottom of the metallic streamer, place a loop on top of the streamer with the stapled end turned toward the top. Position the stapled end of the loop one inch above the bottom of the streamer. Staple to attach. Overlap the top of the next loop 1 1/2 inches above the first loop. Staple the loop to the streamer. Repeat with the remaining loops. Starting from the second loop down from the top, attach an "H" sticker. Continue down the length of the streamer to spell out the word "HOMECOMING." Step 9: Customize with additional embellishments. Place the homecoming loop streamer in the center of the ribbon streamers. Staple the top of the streamer to the backer. Cut an assortment of trims in your school's colors and coordinating metallics. These can be as short as you want, but should be no longer than your longest base ribbon. 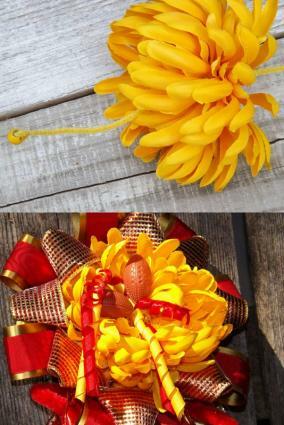 Curling ribbon, wire garland, Christmas tree garland and feather boas are just a few suggestions. Randomly tie bells to the ends of ribbon. Three or four bells are nice, but for a really big festive sound, you could always add more. If desired, add your name, school mascot, grade or year on ribbons with letter stickers. Hot glue trinkets to the ribbons. Step 10: Attach the top backer to the second backer. Pierce a small hole through the center of the second backer using the tip of scissors, a pencil or a wooden skewer. Apply hot glue to the back of the top backer. Insert the pipe cleaner stem through the second backer from the front to the back. Pull the stem through and press the backers together. Allow the glue to cool. If you need to, you can secure with additional staples. Cut the end of the pipe cleaner to approximately two inches. Bend over and hot glue to the back of the second backer. Step 11: Attach the garter. Lay the mum face down on your work surface. Apply a horizontal line of hot glue across the center of the backer. Place your garter over the glue. Allow the glue to cool. Apply hot glue all over the back of the backer. Slip the third backer through the garter and attach to the second backer. Half of the garter will be sandwiched between the backers. Allow the glue to dry. For more stability, add additional staples around the edge of the backer through all layers. Hot glue an additional backer to the back of the last one to cover up the staples for a cleaner appearance. Step 12: Decorate the flower. Hot glue trinkets or small stuffed animals into the petals of the flower. While garters are predominantly made for the boy to wear on his arm, in recent years cheerleaders have also taken to wearing the garter mums on their legs, at the thigh, so they can continue to cheer and move around freely during the day and at the game. If a garter is not needed, the rest of the girls will usually wear them from ribbon around their necks or pinned to their shirts. Drape a soft ribbon around your neck and allow the ends to fall over your chest. Add four inches to the length to accommodate the ends that will be sandwiched between the backers. Keep in mind the ribbon will need to fit over the head. Before adding your loops or points, space the ribbon ends approximately two inches apart on the back of the top backer and the rest of the ribbon extending above the top. Hot glue and staple the ribbon ends to the backer. Many parents and students will hunt and gather special items for their mums all year long. Unique items and ideas seem to be everywhere, but if you wait until the last minute it just might have you exhausted from trying to locate all the goodies. Here are a few tips and suggestions to help motivate you along the way. If this garter is worn on the arm, the streamers will hang approximately six inches above the floor when sitting. If worn on the thigh, the streamers will hang approximately six inches above the floor while standing. 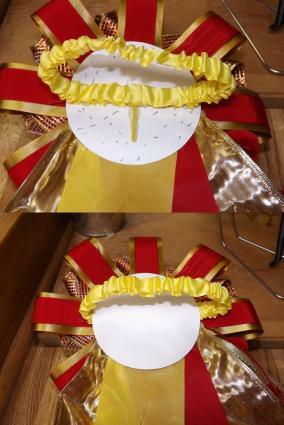 To adjust the length, modify the length of the streamers and the streamer embellishments during construction. There are so many trim options to use as embellishments. Novelty printed ribbons with a football theme are available year round at craft stores and during the football season at discount stores that sell craft supplies. Curling ribbon is inexpensive and adds a lot of volume to a mum. 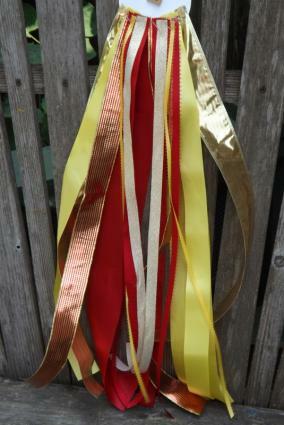 Tulle ribbon helps to blend the streamers together and is available in several widths. Chains with links to tie trinkets to can be found in jewelry making supplies at craft stores, or check out your local hardware store for small chains sold by-the-foot. Party supply stores offer colorful selections of feather boas and small novelty trinkets. Christmas ornaments, tinsel tree garland and battery-operated twinkle lights add a lot of glamour and flare. Small charm frames hanging from key chains and pins are a great way to insert personal photos into the mum. Don't overlook unusual shopping venues. One-of-a-kind embellishments can be found for pennies at yard sales and thrift stores. 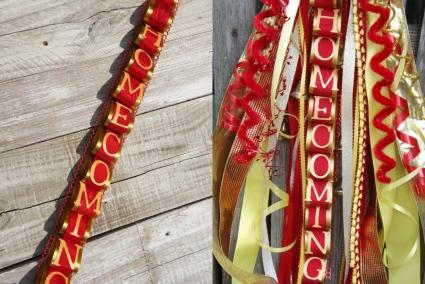 Many schools have adopted traditions with progressive mums where one mum is added per year, ending with four flowers on the homecoming mum as seniors. To accommodate more flowers, either staple several backers together to enlarge the base, or cut one larger one for each layer. The same homecoming mum can be used each year. Attaching more embellishments will transform it into a hanging scrapbook of the wearer's high school years. Glitter pens and letter stickers in assorted sizes can be used to add names, years, grades and sentiments to the ribbon streamers. Small stuffed animals provide another element of the wearer's personality. Wire or glue them to the flower or the streamers. Mum wrist corsages and mum rings, known as ringers, are miniature versions of a homecoming mum. These can easily be made using elastic instead of a garter. Braided ribbons provide another layer of texture to a homecoming mum. Attach them in the same way as the streamers and tie trinkets to the weave. The following tutorials will give you the basics to weaving beautiful braids. Skip to my Lou has a fun headband refashion that utilizes a two-strand braid technique, also known as a military braid. Use her tutorial to create a quick braided streamer. The Artful Crafter has two great ribbon braid tutorials that will show off your school colors beautifully. They are the diamondback braid and the spirit braid. Mum supplies can be picked up almost anywhere. While that is true, it does take time to accumulate the things you will need. The following are a few places you can shop online or in person to gather everything you need in one place. L & M Wholesale and Mum Supplies-Store located in Glen Rose, Texas. Monster Spirit-The physical location, The Saleplace, is in Balsh Springs, Texas. Homecoming Supplies-Store located in Spring, Texas. 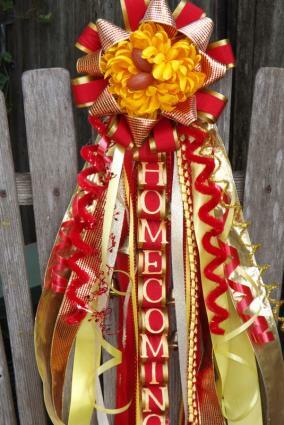 No matter what you choose to include on your homecoming mum, there is no wrong way to do it. Enjoy the making, as well as the memories.